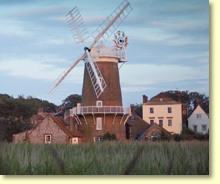 Cottage holidays in the East of England and self-catering holiday accommodation in Eastern England  search for agency and privately owned cottages in Suffolk, Norfolk, Cambridgeshire, Essex and Lincolnshire and book with the owner direct. Do you sometimes go abroad on holiday to escape the rain? We'd like you to consider a cottage holiday in the East of England instead. Eastern England is the UK's driest area and is also often its sunniest. But that's far from the only reason for taking a cottage holiday there. For a start, the coastline of Eastern England is fascinating. True, there are no cliffs worthy of the name, but instead there are mysterious tidal inlets, long stretches of golden beach and bird reserves by the score. Below you can find out more about the counties of East England as cottage holiday destinations, choose between Cambridgeshire, Lincolnshire, Suffolk, Norfolk, Bedfordshire and Essex. Cambridge's neighbour to the west, Bedfordshire, offers the Chilterns Area of Outstanding Natural Beauty in the south, the contrasting wooded hills of the Greensand Ridge in the middle and of course the family attractions of Woburn.